Ain’t no party like a Domo party cause a Domo party don’t stop. 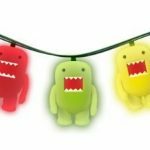 Get your kawaii party on with Domo Party Lights. Ten Domo lights on each one. Now if only we can get Domo away from the sake bar for a minute we can get this party started. Domo! Domo!